Feel the speed with Thunder Tiger’s all new Olympian! 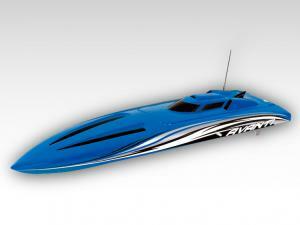 This high quality one-meter deep V-hull speed boat comes with everything you need to cruise on the water at high speed. Thunder Tiger equipped with Ripper 2000KV brushless covered with water cooling jacket power and bundle with ACE RC BLC-180M which Delivering the Ultimate in Efficiency, Speed, and Run time!! The best endurance speed for racing, without rest! This shark heritage is built into every hull which has run in excess of 47mph. Enjoy the Race! Everything is in here: Aerodynamic Hull, Well Pre-painted with Latest Fashion Design, Quick-move Cover and Power Unit, Water-cooled IBL 2000KV & BLC-180M, High-Precision Aluminum Parts. hull design is built up in aerodynamic shape and fashion design on its layer. The integrated battery trays ensures the battery is bound firmly on it. Ride trim is easily adjusted by positioning the packs fore and aft using the convenient hook and loop straps that secure the batteries. 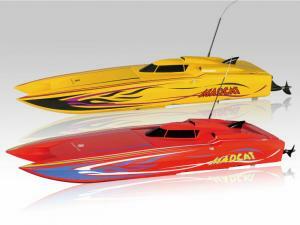 The optimized rudder configuration carves amazing full-throttle turns. 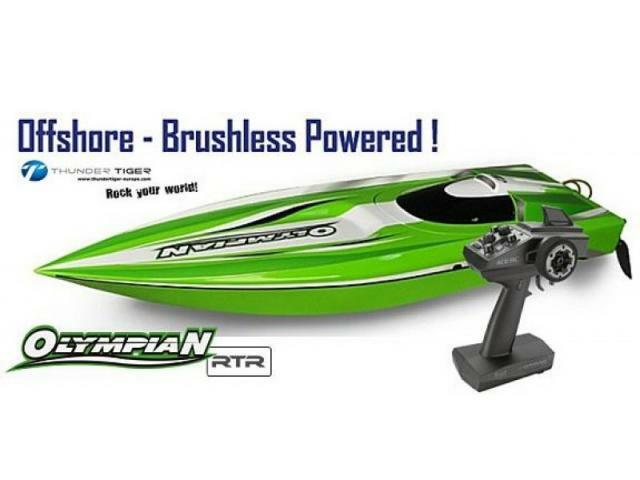 A high-output 2.4GHz radio system, along with water-cooled and waterproof electronics, keep Olympian going for the trouble-free, all-day running you count on from Thunder Tiger. Olympian is fully assembled with a Cougar 2.4GHz radio system, ACE AC Ripper 2000KV brushless power system with water cooling jacket, ACE RC BLC-180M, and detailed instructions. Designed specifically for the intensive power demands of the ACE AC Ripper brushless system, 12-gauge wires and patented Thunder Tiger's High-Current Connectors for efficient power transfer, run after run. Thunder Tiger backs the Olympian and all of our products with industry-leading support that is second to none. A staff of skilled representatives is on-hand to answer your questions via phone, website, or e-mail. Unmatched parts support allows Olympian to be serviced with parts and support from thousands of hobby dealers worldwide. Your investment is also protected by the Thunder Tiger Limited Electronics Warranty. Thunder Tiger goes the extra mile to ensure that your R/C experience is easy and fun! WATER COOLING JACKETThis aluminum water cooling jacket leads water directly flow around the motor and cooling it down. ACE RC ESC BLC-180MDesigned for rc boat, with excellent start-up, acceleration and linearity features. Adjustable Billet Trim TabsThese trim tabs can help you to increase the maximum handling of your boat. Ace RC 1903High torque waterproof metal gear servo. 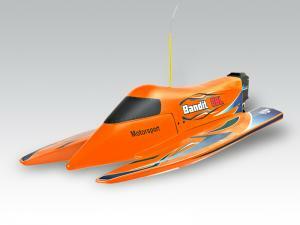 Turn Fin SetKeep your power boat stable in the corners, even in the incredible hight speed. Rudder with Dual PickupsYou can run separate water lines to both the ESC and motor, resulting in better cooling. The new Ace RC CONGAUR GP3 is a simple usage for hobbyists pistol radio system with the latest wireless and ACE RC advanced-programming technologies. With the unique intelligent frequency-hopping spread spectrum (iFHSS+), the radio delivers precise & reliable control without interference risks. In addition, faster encoding data and less power consumption let you have more agility and longer operation, COUGAR GP3 pistol radio system is configured for operation the surface R/C models.